Parliamentary approval of the North Coast Railway from Nundah to Caboolture was sought in 1884 and working surveys were completed in 1885. After the contract for construction was awarded to John Robb on 9 February 1886, some 400 men commenced work on the line. Delays in completing the major bridges over the South Pine, North Pine and Caboolture Rivers held up the work, but the North Coast Railway was officially opened to traffic to North Pine on 1 March 1888. The first North Pine Railway Station dates from this period. It was very briefly the terminus of the line until the extension to Caboolture was opened on 11 June. The North Coast Line, originally a single track, was duplicated in sections from Nundah after 1910 and from Petrie to Caboolture between 1913 and 1917. Extensive regrading and realignment work was undertaken at this time. The duplication project also involved the construction of new reinforced concrete and steel bridges for the second track over the South Pine and North Pine Rivers, followed by the rebuilding of the original bridges alongside. North Pine Railway Station yards showing various forms of transport used by farmers to bring produce to the North Coast Railway, 1890. 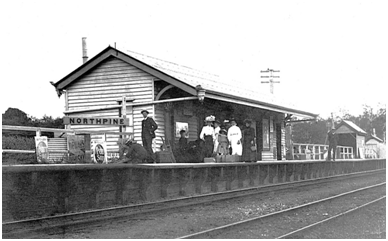 North Pine Railway Station, 1911. North Pine (Petrie) has always been an important station, initially being of prime benefit to local farmers, as it enabled them to send produce to market with comparative ease. A goods shed was retained until 1975 when it was demolished to make way for a commuter car park. Suburban passenger services did not grow substantially until the 1940s. To meet the needs of this increasing suburban service, a refuge platform was inserted on the eastern side in 1951 and the main platform was lengthened in 1957. The establishment of the Australian Paper Manufacturers (APM) Petrie Mill (now Amcor Cartonboard Mill) around this time made Petrie an important freight centre with the mill having its own private siding. Electrification of the line from Northgate to Petrie was commissioned on 23 April 1983 with regular electric services commencing the next day. The commissioning of the next section, from Petrie to Caboolture, did not take place until 28 June 1986. 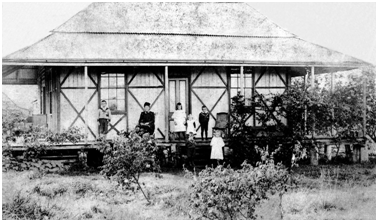 The original Petrie station building was moved to the North Pine Country Park (now Old Petrie Town) in 1991 when the growth of the Queensland railway system rendered it obsolete. Petrie Railway Station, ca. 1990. The photograph shows the car park and the original station building which was moved to the North Pine Country Park (now Old Petrie Town) in 1991.